Got another diving duck for you today in this week’s diving ducks in Centennial Lake theme. Allow me to introduce you to “The Canvasback”. 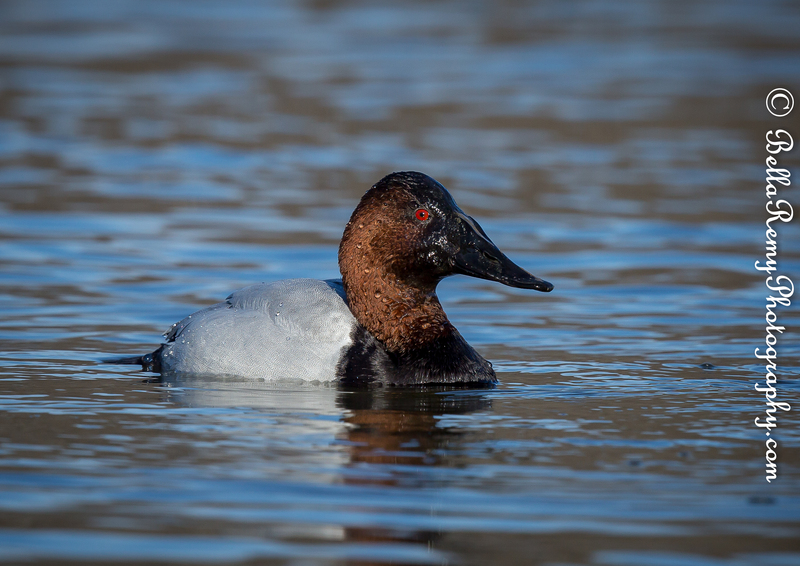 As the largest diving duck found in North America, the Canvasback has bright red eyes. Wintering in the Chesapeake Bay and the southern part of the United States from east to west, these ducks like to summer in the Pacific Northwest through Canada up to Alaska. They are active ducks that like to travel in larger groups. So if you see one, you usually see quite a few. They bob around on the water, then tuck their head up and then dive. 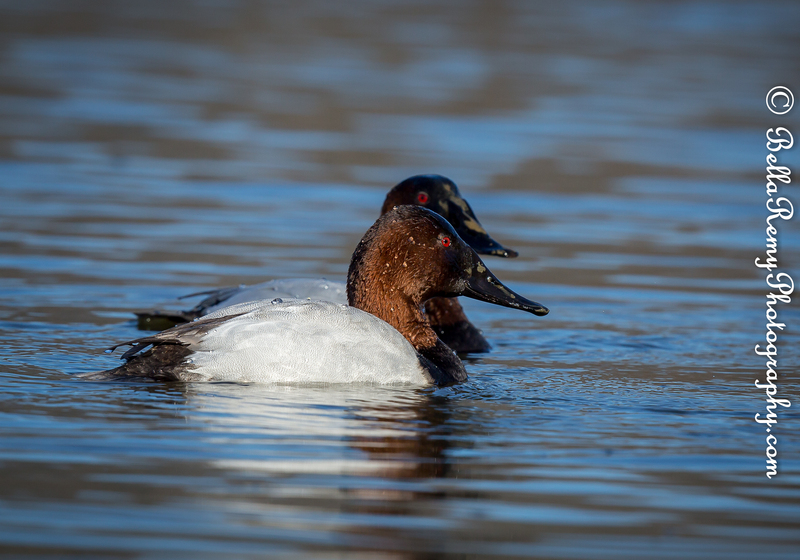 The ladies of the Canvasbacks are subdued, and I’ve always thought that they have a gentle look to their eye. I know right? Wonder what they’ve been smoking? Really! Don’t they know they need to share? That’s funny Andy. Indeed, ducks are quite the character. Oh lucky you !! Hopefully you can get to Centennial lake before you leave. Love Florida – miss Florida – great birds! I’m enjoying your waterfowl series, the writing as well as the great images. Nice work. I feel like I have no imagination right now for the writing, so that is really nice of you to say you like it. Thanks Nick! I’ve never seen them in Florida either Steve. Although the migration map shows they do winter there. Maybe one day you’ll get to see one. Merritt Island is a great place for ducks. Yeah, I gotta get back to Merritt Island REAL SOON! What nice wildlife! So realistic! Thank you so much ! I do try to do minimal post processing to really show nature as I see it. I very rarely do any removal of items in the frame either. You did an excellent successive shots on the dive. Your finger is faster than the speeding duck! When you really start watching them, you can see them begin to prepare to dive. That and lots of successive shots is what gets it. Thanks Perpetua! BTW, received your card today. Oh my, you are just way too kind and it really warmed my heart. Hugs!! Ha ha I love Duck Dynasty, and yours. Those are some cool ducks. I love how sharp your photos are as they really showcase the red eyes, which are intense. The females are a bit more gentle looking, though their eyes are an intense black! Yes those red eyes are a bit creepy, I have to admit it. I really like the details that you have captured in the birds eyes. I hope the duck dynasty boys don’t come along and disturb these beautiful birds. I’m going to find more ducks for you this week Fatima. Keep tuned! Beautiful pictures, about beautiful birds, it’s a very nice article, enjoy. Thank you so much Bill. A huge compliment coming from you. Loved your page, and how it is designed. I may need to borrow the idea for my smugmug page which is a mess and not up-to-date. Appreciate the inspiration from a pro. Brilliant captures, love those crazy red eyes! Aren’t those eyes amazing? Appreciate your kindness Susan. Thank you so much Mark ! Thanks Sylvia, and so thrilled you appreciated the girl as much as I do. They seem special to me for some reason. 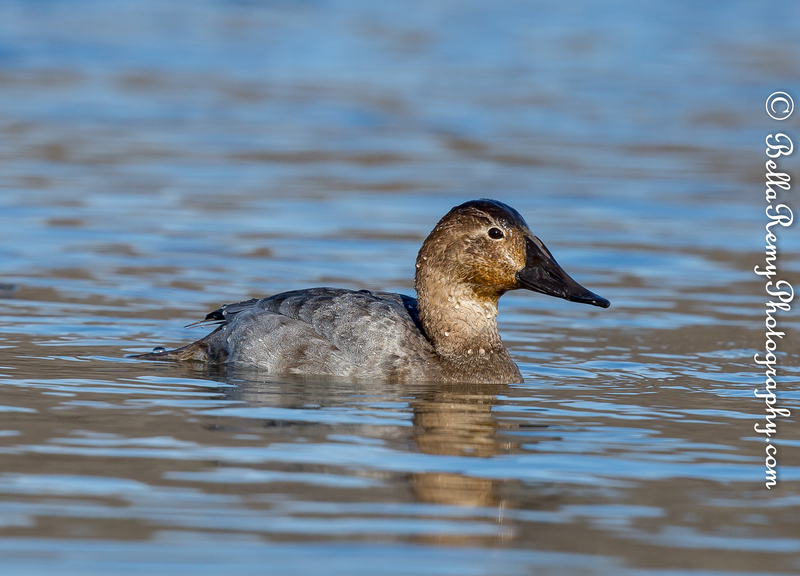 Bella, your photos of the canvasback are spectacular. I carve decoys and have done a canvasback. I’ve started photographing ducks I find mostly down near Chincoteague, Va on both Assoteague and along the bay-side of the Delmarva peninsula. Can you tell me about your camera equipment and glass that you use? Thank you so much Herb ! Indeed, there really aren’t many ducks this winter. But you can always count on them in Cambridge at “The Wall of Shame.” Glad you were able to find my “What’s in my bag” page with my equipment. I do love it so.